The authumn is at the doorstep. Rain, wind and pretty fast dark. If you want to be prepared, you really might need a hat, a bandana or a cap. This week, we have a new Groundspeak cap, but of course we have a number of other options to keep you warm and protected. Last weekend we were present on the Noaberevent in Hengelo, the Netherlands. Beautiful weather and a succesfull event! We have some of the remaining event coins. You can find them in our shop. Next weekend we will be at the Snert event in Sellingen. If you have special whishes, you can send us an email so that we can put a aside for you and bring it to the event. This is the event Geocoin of the Noaberevent held at 10-10-10. The coi n is made with 4 different transparent colors with 3 metallevels. The coin measures: 4,5 x 4,5 cm and 4 mm thick and has been made in limited quantity (100 pieces). This beautiful coin measures 76mm and celebrates the last 10 years of geocaching. This coin sold out at Geowoodstock VIII this summer and we went back and asked Zengarten to mint one more batch. This version of the Mapamundi XXL Geocoin has a diameter of 90mm, is 5mm thick and has a bronze antique finish without colours. The Mapamundi XXL Geocoin was inspired by the atlas catalan of 1375 which for the first time used a compass rose. Design elements show the calendar wheel and the compass rose. This version of the Mapamundi Geocoin has a diameter of 38mm, is 3mm thick and has a bronze antique finish without colours. The Mapamundi Geocoin was inspired by the atlas catalan of 1375 which for the first time used a compass rose. Design elements show the calendar wheel and the compass rose. De Pocket Decoder is 55mm in diameter and 70mm high (excluding the top-ring),14mm thick and weighs 120gram. The case is antique bronze with a red enamel. Only 100 pieces made of this XLE version. 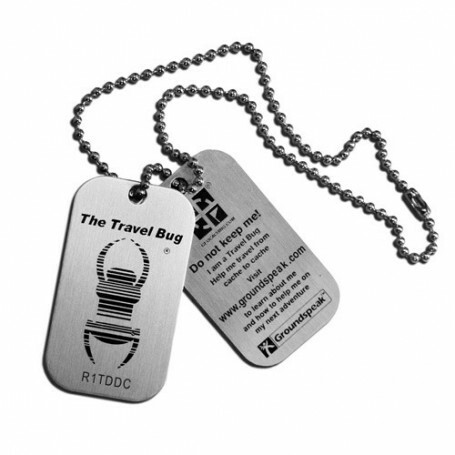 Do you want something special for your Geocaching friend? Then this is ther perfect gift. The earrung sets with Geo-symbol are back on stock again. They will be available again, mid next week. Black hat with groundspeak logo. This Black Twill Cap features the full color Geocaching.com logo. Sizing is adjustable. Wear it with pride as you enjoy your next geocaching adventure. Remember, you can never have too many hats, especially geocaching hats. Also the Hat Tech and Nature is back on stock.